Motto: "الدائمون المحسنون بالهدى" "Sentiasa membuat kebajikan dengan petunjuk Allah"
^ Malay is the official language as stated under the Constitution on Article 82: "Official language". ^ Under the Constitution, English is mentioned for use for some particular purpose on Article 82: "Official language". ^ Also 080 from East Malaysia. 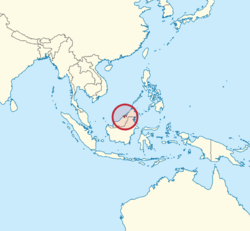 Brunei (officially called the Nation of Brunei, the Abode of Peace) is a country in Southeast Asia. It is north of Malaysia (Borneo). The country is rather landlocked by Malaysia. To the north is the South China Sea and the Philippines to the northeast. The capital of Brunei is Bandar Seri Begawan. The country has a small area and not many people live there. The leader of the country is the Sultan of Brunei. He is one of the richest people in the world, because he owns a lot of oil. The main religion in Brunei is Islam there are also people who follow Buddhism or Animism. The native languages of Brunei is Malay and English as second language. Brunei is one of the smallest Muslim countries in the world. From the 14th to the 16th centuries Brunei Darussalam was the seat of a powerful sultanate extending over Sabah, Sarawak and the southern Philippines. Thus, the current Sultan represents one of the oldest continuously ruling dynasties in the world. By the 19th century, the Brunei Darussalam Empire had been whittled away by wars, piracy and the colonial expansion of European powers. In 1847, the sultan ended a treaty with Great Britain and in 1888 Brunei Darussalam officially became a British protectorate. In 1906, the Residential System was established in Brunei Darussalam. A British Resident was nominated as a representative of the British government to advise the sultan in all matters except Malay customs, traditions and Islamic religion. The 1959 Agreement established a written constitution which gave Brunei Darussalam internal self-government. In 1971, the agreement was amended and revised to assert full internal independence except defence and external affairs. In 1967 His Highness Sultan Haji Sir Muda Omar Ali Saifuddien abdicated in favour of his son Pengiran Muda Mahkota Hassanal Bolkiah. On January 1, 1984 Brunei Darussalam resumed full independence and the Sultan took office as Prime Minister, Finance Minister and Home Affairs Minister, presiding over a cabinet of six. In October 1986, the cabinet was expanded to 11 members, with His Majesty relinquishing the portfolios of Finance and Home Affairs and taking over the Defence portfolio which his late father had held since 1984. In 1988 another reshuffle brought about the elevation of the deputy minister to a full minister and the creation of the Ministry of Industry and Primary Resources designed to boost the country's development. In spite of the sizable non-Muslim population (about 1/3 of the population) and criticism by the international community, the Sultan still announced Brunei's adoption of Sharia law in 2013 to fully enforce on the Muslim majority and partially enforce on non-Muslims. Is is expected to take full effect in 2016 after 3 phases, and had begun partial enforcement in its first phase in 2014. It is the first country in East and Southeast Asia to practice Sharia law. Brunei uses the Brunei Ringgit to trade. However, the Singapore dollar can be used here as both currencies are of the same value. ↑ "Brunei (Languages)". Ethnologue. Retrieved 2 August 2013. ↑ "Give recognition to our languages". Retrieved 19 November 2013. ↑ "Call to add ethnic languages as optional subject in schools". Retrieved 19 November 2013. ↑ "Writing contest promotes usage, history of Jawi script - The Brunei Times". ↑ "Sultan of Brunei holds dinner for His Highness Amir". Kuwait News. 11 October 2016. Retrieved 30 October 2016. ↑ Brunei. CIA World Factbook. 2011. https://www.cia.gov/library/publications/the-world-factbook/geos/bx.html. Retrieved 13 January 2011. ↑ 7.0 7.1 7.2 7.3 "Brunei". International Monetary Fund. Retrieved 8 December 2011. ↑ 9.0 9.1 Brunei Sultan Haji Hassanal Bolkiah Mu'izzaddin Waddaulah Handbook. IBP USA. 2011. p. 10. ↑ "CONSTITUTION OF BRUNEI DARUSSALAM" (PDF). Attorney General's Chambers Brunei Darussalam. Retrieved 15 October 2013. ↑ "Home - Jabatan Perdana Menteri". www.jpm.gov.bn. ↑ "Brunei adopts sharia law amid international outcry". CNN. This page was last changed on 11 February 2019, at 18:32.